Remember Tangerine Dream's Green Desert? Many a time have I discussed its legitimacy as a long lost album with people. Hailing from 1985, yet claiming to be from 1973, it just didn't seem to fit musically between Atem and Phaedra. 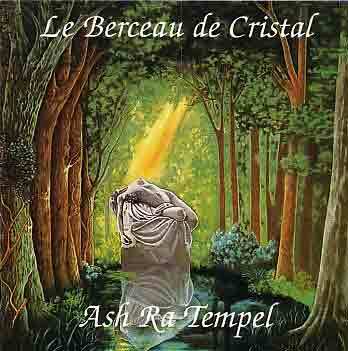 Le Berceau de Cristal, a "lost" soundtrack from 1975, is far more believable, yet still fairly enigmatic. This one fits in the gap between Ash Ra Tempel and Ashra (sans Tempel). While I could be wrong, I don't remember ex-Agitation Free guitarist Lutz Ulbrich playing with Göttsching until Blackouts but I don't claim to be an expert here, and he is credited as a second member. Anyway, this doesn't really fit comfortably anywhere in Ash Ra history. Göttsching's use of the Farfisa Organ reminds one heavily of early Klaus Schulze circa Cyborg or Blackdance, especially with its bubbling synth rhythms and dark and solitary melodic content. Yeah I guess you can hear Göttsching's guitar playing in the style of Inventions which this supposedly followed, but there is a different mood here, more like early Schulze than the upbeat stuff that Göttsching and Ulbrich would do later on. To me, Ash Ra has always been a hit and miss affair anyway ("Hits" - Ash Ra Tempel, Join Inn and Inventions..., "Misses" - Seven Up and Starring Rosi) although I find that the later stuff grows on you over time. I'm still not sure where this one fits, but, hey, obviously it's a must if you like this era of innovative synth music.